With warm weather come short skirts. 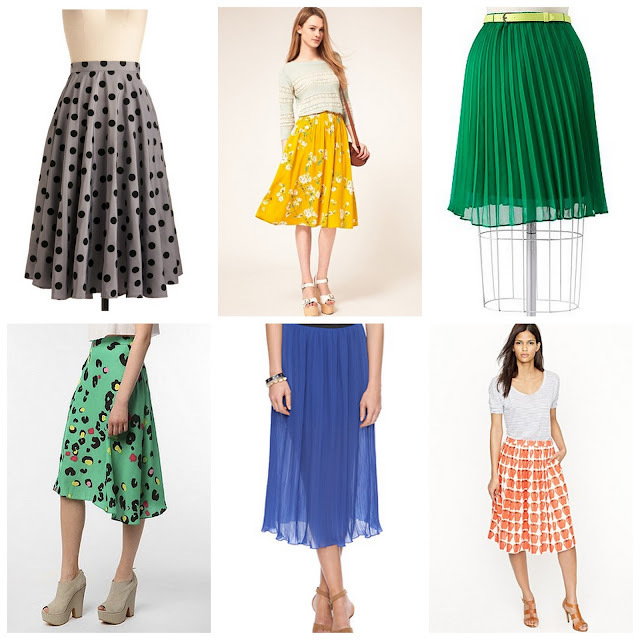 But this Spring, we're starting to see a new trend -- longer, looser skirts that fall below the knee. While bodycon and minis are still in, we're loving this more flowy and carefree option. It's perfect for hot summer days, traveling, and every day use. We fine it a much more practical option as compared to the restrictive body skirts and the bottom heavy maxi styles. Plus it's less dangerous to wear on a windy day (such as today) than the mini flowy skirts. It's like Betty Draper combines forces with Peggy Olsen, minus the heart of coal and the pilgrim style. wow... the outfit look beauty.